At this years Tabletop Sale approaching 100 Members and visitors enjoyed viewing, and in some cases buying a whole range of new and not so new electronic and other radio related items. As usual we had visitors from far a field, some traveling a good distance to attend. A few faces present on the night were also seen at the Hockley Emporium some days beforehand. As usual the event was widely advertised both in the local press and on local radio. Readers of RadCom, PW and SWM and other radio magazines had all the necessary information clearly displayed. Many leaflets were produced for display in local libraries, bookshops and public notice boards. Many thanks to the high number of Club members who came along to sell or to buy or maybe to chat, contributing to a great atmosphere. Thanks too, to those who donated for sale, some very fine items to be sold for Club funds. Before the talk started Leslie disappeared outside to erect his aerials for the later demonstration of Beacon monitoring. He started by discussing topics such as: - Why use Beacons; What do we need to know IBP - International Beacon Project Where to get further information Is the band dead if no-one is transmitting? Answer the last question in 3 minutes! Frequency segments - and - Tools for Beacon listening, e.g. software/hardware. 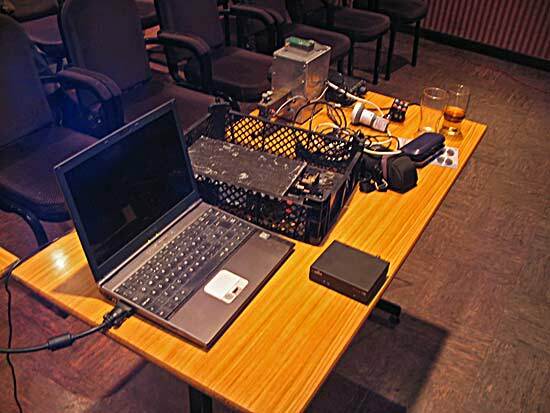 At this point Leslie demonstrated the MFJ Dx Beacon Monitor. It is a box with the map of the world on the front with LEDs at the NCDXF Beacon sites, the LEDs light up when that particular beacon is transmitting on the chosen QRG. The timing is obtained from an internal radio controlled clock. The demonstration of Beacon reception took place but unfortunately it failed due to the flat conditions. Beacons can be used as propagation indicators, to align radio equipment – especially at the microwave frequencies and can be used to obtain auroral warnings and to obtain solar data, etc. (See DK0WCY). In order to successfully utilize Beacons we need to know, where they are, their callsign and what frequency they are on and when, (these last points must be accurate). We also need to know the output power, the aerial in use and whether or not it is currently serviceable. Next Leslie discussed the IBP beacon project, which is run by the NCDXF organisation. Full information on this beacon chain can be found at http://www.ncdxf.org/beacons. The essence of receiving these Beacons is in the timing. Accurately knowing this Leslie pointed out means it is not necessary to know the Morse Code. The Beacons transmit on 5 separate frequency bands, but it is easier understand this by first taking a single band sequence, such as on 14.100MHz. The Beacons transmit in sequence for 10 seconds during any 3-minute period, starting on the hour each hour of the day. The sequence of transmissions can be seen from the above web site. There are various tools available to assist with listening to this Beacon chain; a good example is the MFJ box mentioned above. For the computer literate among us – FAROS is an excellent example of computer automated listening. Their web site has much more information on the chain as well as some interesting historical facts. Someone asked what aerial is best utilized for reception of the Beacons, Leslie answered that he preferred a dipole. (Theoretically a vertical may be better – Author). Are there any planned changes to the current NCDXF equipment was the next question, Leslie said, none planned. 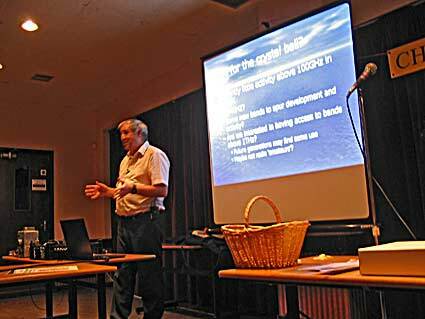 Leslie, is also a RSGB board member with Portfolio Technical Committee & Propagation Studies Committee so he put on his RSGB Board Members hat and asked the audience where they thought the hobby should be going? Some discussion took place as to why the RSGB Council proceedings were on the web but not put into RadCom. Leslie said that he thought that they should be included and that furthermore he was not happy with the amount of help info; help lines etc. that appear in RadCom. Our Chairman then asked whether there was anything that our club could do to assist in this. Leslie simply replied that writing in might help. There was then some discussion concerning technical articles in RadCom, it appears that this is all under the control of the Editor (technical) and he has been extremely stretched of late! Someone asked about Bletchley Park to which Leslie said that this is still going ahead. But further information will come out of the GB2RS news broadcasts and G3LEQ controlled these. Some discussions then took place concerning the GB4FUN vehicle, it would appear that this is to go and a new fold-up vehicle is to be purchased instead. Our Chairman then concluded the Meeting by stating that the Committee would put the salient points together in a letter to be addressed to HQ. The usual high quality Raffle was organised by Geoff G7KLV & Colin G0TRM. By superb timing, the BBC announced that day that they had launched a Satellite Service along with ITV with the aim of providing High Definition TV from space for FREE, hence its new name “Freesat”, to complement Freeview. After the break Murray, G6JYB then presented a visual presentation about this attractive project. You can receive most of the “Freeview” channels plus a few more, inc BBC& ITV-HD, together with digital subtitles, audio description and radio. Press the “Red Button” and one can then have access to the latest news, live sports, together with a 7-day on-screen programme guide. Murray highlighted you need a certified Freesat-spec box (£50 to 150) and if you do not have a modern “LNB” you will need a new dish. Note that Lidl etc Satellite systems are not compatible with the Freesat EPG, data and future broadband service that will appear later. For HD viewing you will need a HD Ready TV with HDMI connections. G4DDK is a Radcom Microwave columnist and is also one of the UK's leading Moonbounce (EME) operators. on 1.2 and 2.3 GHz. He provided an update and some crystal ball gazing regarding the future of amateur microwave radio equipment and operations. Sam, later on into the presentation. Notice the Raffle basket for the 14 prizes. Sam showed some old, modern and possible futuristic amateur microwave equipment. He also suggested where this seemingly niche, but ultimately the future, of amateur radio is heading. After drawing 14 Prizes from the Raffle, run this month by CARS President, Harry, G5HF assisted by Ethel, Sam showed a list of current Microwave Records held by UK Amateurs. 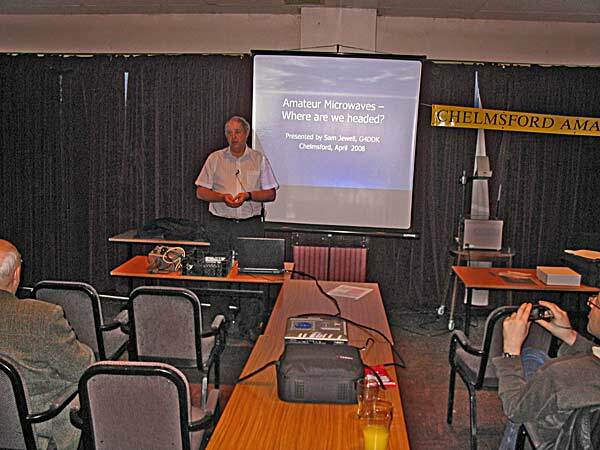 This included a recent 24 GHZ Record made by Chelmsford Amateur, John Wood, G4EAT, who was in the audience. John's report of how it came about is reproduced with his permission. The weekend weather was forecast to be cold with temperatures of -5C overnight, so I was expecting to see a big reduction in water vapour losses at 24GHz. These losses are usually very high in the summer and an extra 0.25dB/km loss is typical so the winter months are normally best for 24G DX. Also seen in the weather forecast was an unusually high anti-cyclone 1045mb over the UK which was expected to decline and therefore also likely to provide some tropo enhancement. It is always good to test 3cms first to see if there is any tropo enhancement on the higher microwave bands. I raised Gerard PA0BAT (JO31fx) via the ON4KST microwave chat site. At first Gerard could not hear me on 3cms but after raising his tower another 12m he was 59+10. We QSY'd up to 24G and he copied my reports on CW almost straight away. After a small adjustment to his 80cms dish he then gave me 57 on SSB. QRB was 408km, a new UK record for the 24,048MHz band. The previous OK record was for a QSO between Charlie Suckling G3WDG and PA0EZ at 391km in 1997. Arie, PA0EZ (JO22of) then requested a test but had no 3cms operational. We tried directly on 24G and had a solid CW QSO over a 319km path. This was an excellent "hot topic" meeting. Last revised:- 14th June, Added May & spoofed June's Meeting Reports. Added G4EAT Report. 4th April - added photos. 3rd April 2008. Created this page.